+ Much more! The Free Dictionary is like getting 100+ apps in one easy-to-use interface. * Find every word you search for. 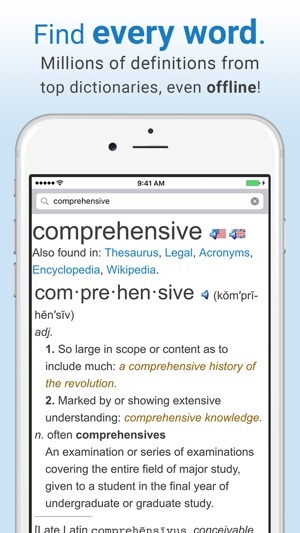 Clear, accurate definitions from top dictionaries—online and offline. 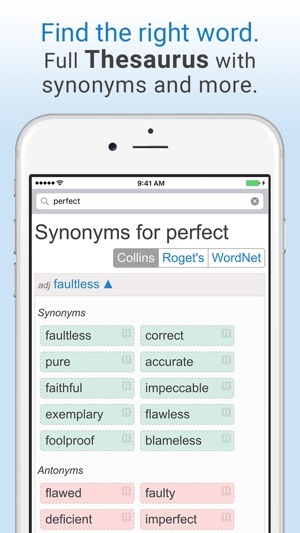 Free Thesaurus with simple interface makes it easy to find the perfect word. 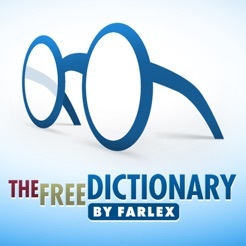 Browse synonyms, antonyms, and related words. Don't just look up words—learn how to use them! 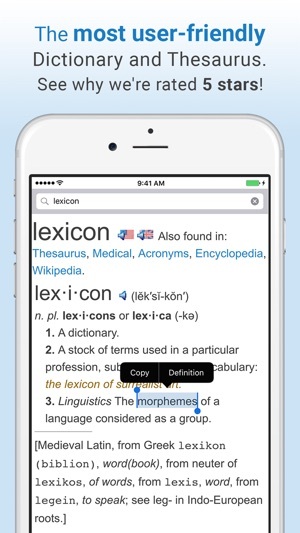 The perfect dictionary app for word lovers and learners of all levels. Spelling Bee, Hangman, and more. * See idioms in action. Watch idioms videos inside the app! Featuring animations of words and phrases from the idioms and slang dictionary. 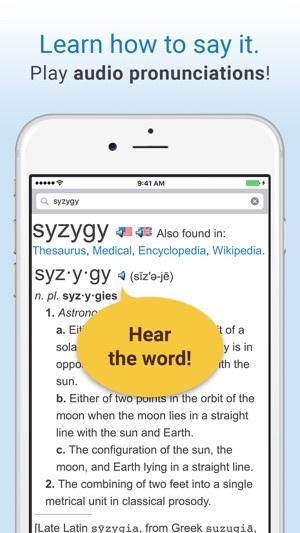 * Access dictionaries in 13 other languages. + Italian, Portuguese, Russian, Chinese, and more! Or translate other languages into English. Access dozens of other translation options. * Voice search. Look up a word just by saying it. 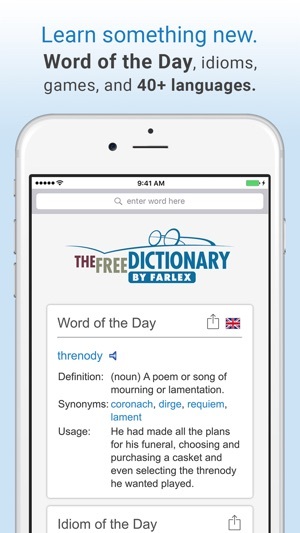 The Free Dictionary app has been downloaded tens of millions times across multiple platforms, with top ratings after hundreds of thousands of reviews. 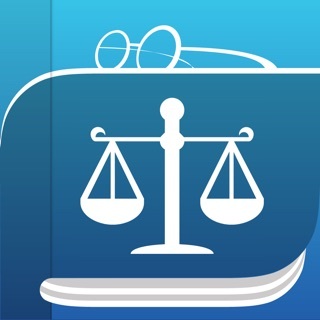 Read reviews from real users to see why they say The Free Dictionary is the best dictionary app they've ever used. Much to be learned here; and If just rating for that, I’d rate them all 5 stars. But as for administration of the points system, I struggle to give them a 3. The number of points credited seem to depend on various and seemingly unrelated factors. 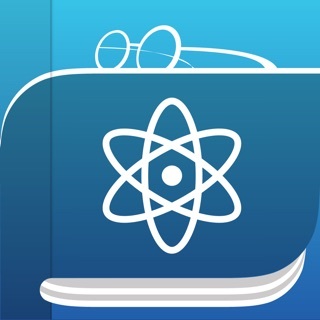 Many days I’ve noticed that more points result if I use the app early in the day or more points the longer duration of time I spend using the app to learn. Not today. Today I have just begun to use Hangman portion under 4 times, but already only get 1 point per try for being correct instead of 2! Often I get interested in subjects so I put in extra time & investigate the many additional links shown. At the start of my putting in the extra effort, I was expectantly pleased to see the points go up as well. After a short number of weeks in realizing that, I began to note a change. Now I see very little, sometimes ‘no’ increase in point status. I did contact them twice about this discrepancy, but their reply was brief and basically stated that this was just the way the app functioned. So I conclude that the app is designed to limit rather than encourage learning. In the final analysis, just appreciate the knowledge for how it can enrich you personally & forget about their so ridiculous scoring system.!!! I previously rated this app a five star rating. I still give it a five star rating, however, now, every time that I want to look up a word, I not only have pop up adds, but I have to hear the same old advertisements. It is virtually impossible to read and listen to advertisements, so I hope they remove the voice activated advertisements. 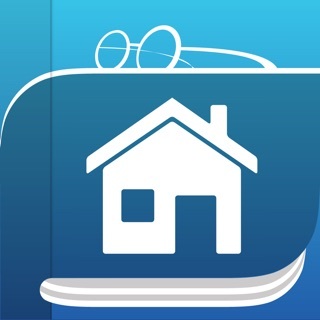 Other than the adds, it is a great application! I do enjoy the biographies of famous Authors and the opportunity to read quotes or examples of the authors' books and literatures. Especially from the 1800's. A glimpse into the past and how our cultures have evolved, regarding etiquette, and formalities. We have lost our higher standards of Education, especially regarding our English linguistics, vocabulary and composition. People spoke much more eloquently with dignity and their vocabularies were much more broader during the Middle-Ages, for example, playwright and actor William Shakespeare's writings were superb and he was born in 1564 and died during the dawning of the Renaissance period. Thank you for your feedback. Please contact us at support[at]tfd[dot]com so we can try to determine why you are encountering these issues. However, occasionally I will have to resort to another dictionary to find the word I need. Definitions from several sources are given: a helpful feature. Often word origins are included. Common foreign words/phrases are included. There are usage notes, usually when I need them! Some proper nouns are included. There is an offline alternative and it is free. There are two text methods of pronunciation. 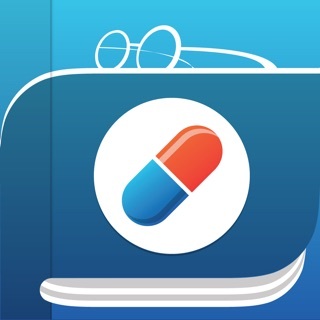 There is an audio pronunciation feature and it is free. Having said that, the first two audio voices - American and British - accessed by the flag icons - frequently and laughably butcher pronunciations. 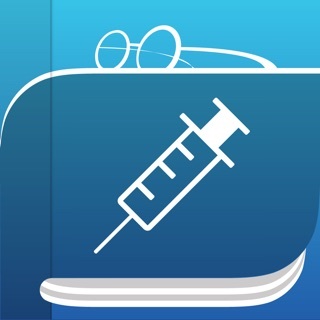 Witness “ampoules,” which the Brit voice pronounces with an extra “l” as “amplool.” There are many more, and more extreme examples, but I’ve forgotten all of them (fortunately or, with my suggestible nature, I might be walking around sounding like an illiterate fool)! The male American voice, accessed by the speaker icon, is the most accurate. Obviously some thought and expertise were involved in his software. But I use the American and Brit pronunciations only if I want a good laugh, or, if I want to see how thoroughly a word might be mispronounced. Maybe you’d like to think about offing the Brit and the flag Yank! Nevertheless, Thank You for publishing this dictionary because, despite its flaws, it is my go-to dictionary, and I use it frequently.